The first two episodes of Thundercats (2011) don't have much in the way of gameable ideas as far as I'm concerned, but that makes sense. These two episodes are, in reality, a single ~hour long episode that lines up perfectly with the first gaming session of any campaign. Its purpose is to set the stage and form the party. These two episodes accomplish that quickly and effectively by establishing the world's status quo (i.e., Highly civilized and technology is myth) and then destroying it. As episode two ends a party of five (thief, thief(bard? ), fighter(speed), fighter(strength or maybe a paladin), cleirc) has essentially been formed, has been given an objective, and has no way to go back to normalcy and shirk the quest. It's good stuff, but is more "trope, trope, trope" instead of "idea, idea, idea" like the other episodes. Episode 3, Ramlak Rising, is where the adventure begins in earnest and where the RPG ideas start rolling. The party leader is pissed (e.g., "You're angry Lion-o." "I should hope I'm not the only one!") but his dad just died and civilization ended so it's cool. The party now has to decide if they're going to go after the McGuffin or the Big Bad Evil Guy. 01. A child thief plays a magic flute in the smoldering ruins of a once great city. 02. A pair of theives steals from looters too busy to guard their haul. 03. Two young orphans near the wreckage of a wagon, claim to know of an ancient city of treasure, and begin following the party. They're hungry. 04. A literal sea of sand. With waves and everything. 05. Food in the desert looks like a mirage, but it's real! It's also a trap. 06. 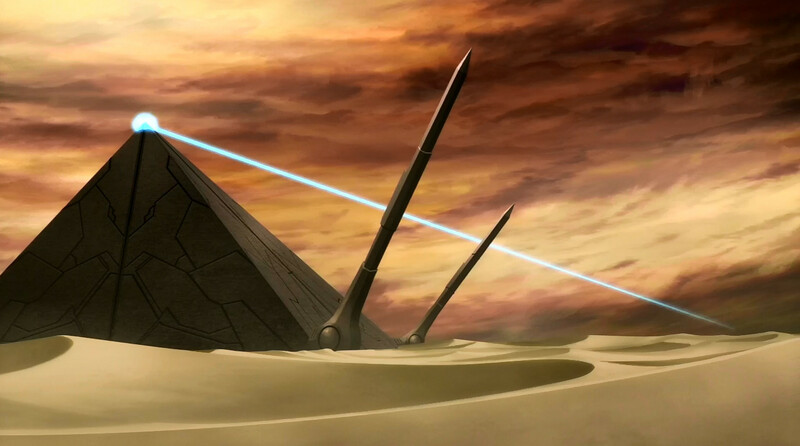 An airship that can only fly over sand hovers on a cloud of lightning. 07. A non-lethal trap (cage, net, pit, etc) has been set by a group of fishmen to catch a very specific creature. If it accidentally catches the party the fishmen's first response will be to turn them into chum and reset the trap. 08. A man with a missing leg hunts the creature that took it. Well past the point of sanity. His peg leg is made of brass and super stylish though. 09. Under normal circumstances the new friends the party just made would eat you. Their leaders respect the new arrangements but things are proving difficult for the rank and file. The party just smells sooooooo good. 10. It's easy to find the large monster that's been terrorizing the countryside because of the way active thunderstorms build up over it. The problem of course is that the lightning strikes don't even tickle it. 11. It's raining rocks. Big ones, about the size of a cat. 12. A lantern of dark magic contains the soul of a good cleric. The cleric knows the location of an item of great power, and the lantern (against the cleric's will) projects a beam of light in the direction of this artifact no matter how far away it is. "Take out the arms. Then we go for the head"
"Do you know what it's like to have everything taken from you and replaced with rage?" "The food's fightin' better than you."